DNA testing shows supposed yeti samples are actually from bears and a dog. This time of year, a mysterious creature known as the Abominable Snowman is likely to make an appearance. But don't worry — the yeti is likely just a bear. For centuries, people have claimed to have seen the yeti in the wild. They've collected bone, teeth, skin, hair and even droppings from the Himalayas and Tibetan Plateau where the creature is said to live. Scientists recently performed the most thorough DNA tests ever on these samples, and the results are either disappointing or reassuring: Most belonged to black and brown bears, not a mythological creature. For what it's worth, the researchers said their work also gives us a better understanding of how bears evolved. 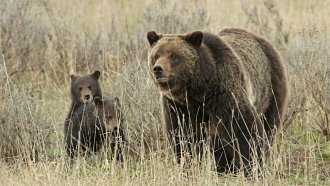 They found while Tibetan brown bears share ancestors with bears in North America and Eurasia, Himalayan brown bears are part of a separate lineage that diverged from other brown bears some 650,000 years ago.